Drawing the fashion back with style is easy — and necessary, given all the backless numbers you see in the fashion industry. Forget rippling muscles, because drawing a fashion back is mostly about a smooth and simple style that works for your fashion figure. 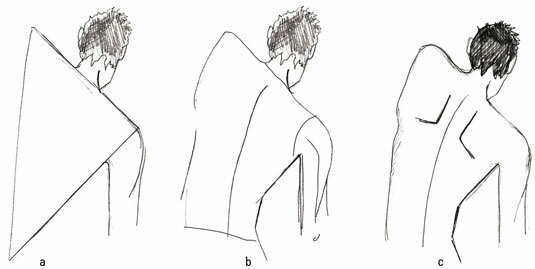 Drawing poses from the back conveys an attitude of confidence — both in your fashion model and in yourself. As with certain front poses, you can create striking poses with angled shoulders and hips. Supple spines are graceful looking and convey just the right accent when you’re using the inverted triangle for the shape of a back. A long, slightly curved line works wonders when defining the back of a fashion figure. 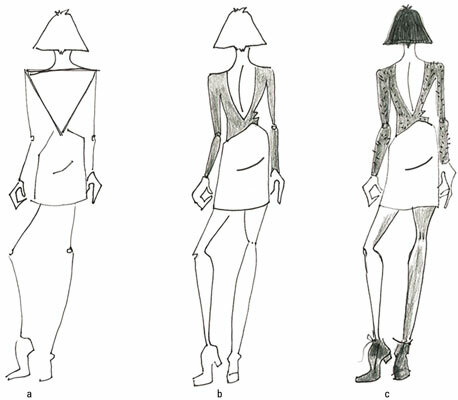 Draw the back of a female fashion figure using a thin inverted triangle. Draw a long, slight curve for the spine and fill in the fashion figure. Draw the hair short to show off the back. Broad backs are obviously for drawing fashion figure dudes. This is the look you want when you draw an awesome guy in a bathing suit or wearing jeans only. It’s show-off time, and drawing a wide inverted triangle for the back helps you do just that! Draw the top half of a dude using a wide inverted triangle for a back shape. Use the base of the inverted triangle for a strong shoulder line. Draw the shoulder line at an angle. Add a strong line to show a good spine and add in the waist. Draw masculine-shaped angel wings for muscle definition.